Brånemark defined osseointegration as a direct, structural, and functional connection between ordered living bone and the surface of an implant subjected to functional loading. Since the formulation of this definition, it has been established that dental implant osseointegration is a biological process similar to a fracture repair. Therefore, loading protocols have been established based on techniques and biological stages that consider not only the biology of the host bed, but also the systemic characteristics of the patient. Recent studies have shown the complexity of the bone tissue dynamics; in fact, the balance between osteoblasts and osteoclasts is important not only for bone homeostasis but also for the cells themselves as a part of the immune system. Both, osteoblasts and osteoclasts respond to cytokines produced by innate and adaptive immune cells, and it has been shown that osteoclasts can act as antigen presenting cells. Different theories explain the failures and complications of dental implants, including excessive surgical trauma, bacterial contamination, premature overload, and impaired healing response of the host. The compromised healing/adaptation theory, states that the failure of an implant depends on the combined action of several subfactors that can alter the bone cells and their vascular supply. Koka and Zarb proposed two terms, “Osseosufficiency,” defined as the ability of the host site to correctly heal and allow osseointegration, and “Osseoseparation,” defined as the inability of the host site to maintain osseointegration. It has been shown that dental implants, when in contact with host tissues, present immediate adsorption of proteins onto their surface. The physicochemical interaction between host proteins and the implant surface leads to a change in the molecular conformation of one or more of these host proteins exposing sequences of previously hidden amino acids that act as antigenic epitopes., Hu et al. showed that adsorbed fibrinogen is the main protein responsible for the accumulation of macrophages on the surfaces of implanted biomaterials. 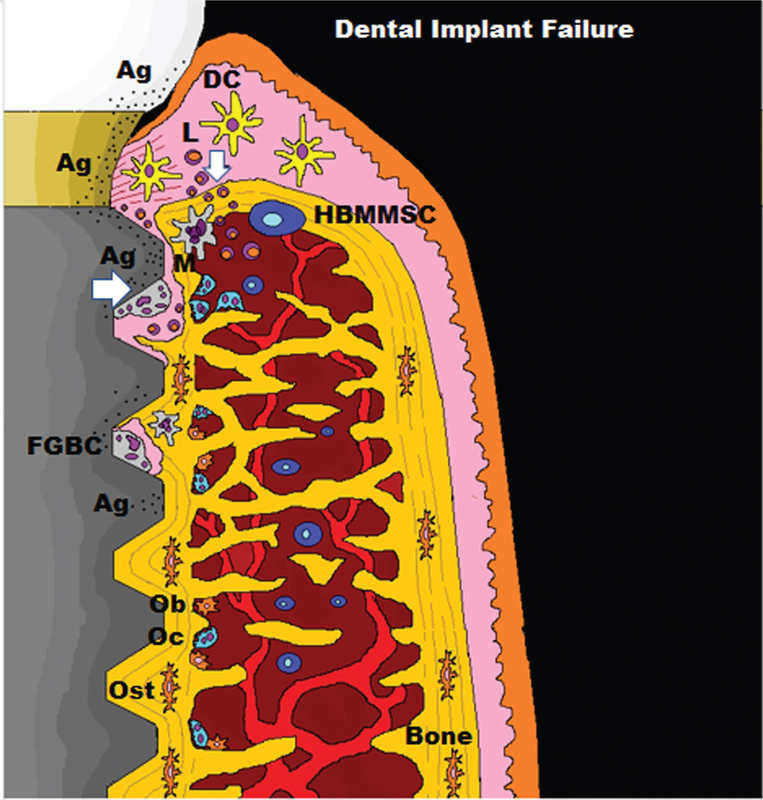 The presence of antigens on the surface of dental implants could trigger immune and inflammatory responses that initiate a foreign body reaction (FBR), which finally reaches a FBE allowing the normal function of the implant [Figure 1]. This phenomenon was indirectly detected in studies of the 1980s, which describe a heterogeneous interface. Connective soft tissue, blood vessels, bone marrow, and a layer of nonmineralized amorphous tissue, of 100 to 400 nm in thickness, between the bone and implant surface was observed, with between 56 and 85% of contact between bone and titanium. Some studies have shown an absence of bone implant-contact (BIC) in 100% of the implant surface, which reinforces the idea that osseointegration is not equivalent to the repair process of a fracture. Up to date, it is not known which is the ideal BIC that allows an adequate clinical function. Osstell developed an implant stability quotient to evaluate the rigidity of the bone-implant interface. This method is currently widely being used among clinicians; however, it does not provide conclusive histological information regarding the bone-implant interface. Macrophages are recruited in response to the presence of a foreign entity in the body, fusing and forming foreign giant body multinucleated cells (FGBC). Donath et al. described through histological studies, the presence of FGBC on the surface of titanium implants, which were present in multiple cases of FBRs. The loss of the FBE could be the main cause of peri-implant bone loss. This concept is reinforced by the fact that osteoclasts can be formed by the fusion of multiple macrophages, and some authors even suggest that macrophages can perform bone resorption functions, and this point highlights the importance of continued clinical care for patients treated with osseointegrated implants and reveals how dynamic and fragile osseointegration can be. The human bone marrow-derived mesenchymal stem cells (HBMMSCs), resident in the maxillary and mandibular bone, immunomodulate osseointegration, through the bioactivating effect of extracorporeal shock waves therapy (ESWT) [Figure 2]. Mesenchymal stem cells (MSCs) represent one of the most promising tools in regenerative medicine, thanks to their potential for proliferation, differentiation, and immunomodulatory functions. More than 400 studies have explored the immunomodulatory effect of MSCs for the treatment of various autoimmune conditions, including graft-versus-host disease, diabetes, multiple sclerosis, Crohn’s disease, and organ transplantation. The finding that cultured MSCs have immunomodulatory properties comes from experiments that show direct inhibition of T cell proliferation by MSCs. Currently, it is known whether MSCs affect not only T cells, but also other cells of the immune system, such as dendritic cells (DCs) and macrophages. Langerhans DCs are present at the peri-implant mucosa, and constitute a part of the first line of defense against infection. In addition, it has been observed that Langerhans cells are more effective in stimulating T cells than DCs from the skin. HBMMSC modulate the immune response through a series of mechanisms; among these, the generation of tolerogenic DCs (Tol-DCs). It has been demonstrated that HBMMSC act on DCs, inhibiting the differentiation of precursors, and also by suppressing their maturation and chemotactic activity. In addition, DCs cultured with HBMMSC lose their ability to stimulate CD4+ T cells. The presence of Tol-DCs could not only help to better tolerate grafts in transplant areas, but also to modulate the local response in favor of osseointegration. It has been suggested that some biomaterials favor DC maturation and influence their phenotype. This can alter the FBE, especially considering the wide range of “biomaterials” used in implantology, including cemented implant crowns. HBMMSCs also modulate B cells, NK cells, and macrophages. HBMMSCs stimulate IL-10 production by resident macrophages. IL-10 inhibits the production of other inflammatory mediators such as IL-1, which is the most prevalent cytokine detected in peri-implant bone defects. Moreover, it has been shown that IL-1 receptor blockage changes the healing response, by modulating proinflammatory cytokine production and increasing the number of M2 macrophages. In animal models, the administration of HBMMSC has been able to reduce IL-4, IL-5, and IL-13. This is particularly interesting because it is known that IL-4 promotes the formation of FGBC in vivo. Extracorporeal shock waves are supersonic waves, generated by different types of devices, such as electrohydraulic, piezoelectric, electromechanical or pneumatic, which generate transient pressure changes that propagate through the tissues where they are applied. This wave is characterized by high energy, rapid ascent and slow descent with a negative energy phase known as cavitation. These waves spread through tissues of different densities where they are applied, generating a cellular and extracellular biological response. At present, these waves are widely used in the context of therapeutic mechanotransduction. Mechanotransduction is the mechanism, by which a mechanical disturbance influences gene expression and cellular behavior. The cells are sensitive to shear, tension, and compression forces, and can respond to cell proliferation, migration and tissue repair. Biophysical stimuli, particularly the treatment with extracorporeal shock waves (ESWT) and pulsed electromagnetic fields, can induce the proliferation and differentiation of MSCs from different origins. It has been proven that mechanical stimuli of low amplitude stimulate the activity not only of the bone cells but also of MSCs of the HBMMSC. It has recently been demonstrated in vitro that ESWT acts as an effective bioactivator over HBMMSC, increasing their rate of growth, proliferation, migration, and healing responses and in contrast reduces the apoptosis of these cells. Therefore, it is suggested that ESWT could be an adequate tool for the preconditioning HBMMSC to express all its therapeutic potential, and, thus, be able to counteract the complications that arise from graft rejection by the host in transplant environments. It has also been shown that ESWT promotes the growth and differentiation of HBMMSC towards osteogenic cells. Multiple experimental and clinical studies show the efficacy of ESWT in accelerating tissue repair and regeneration in various wounds. Potential mechanisms include the ability to induce neoangiogenesis, recruitment of MSCs, stimulation of cell proliferation and differentiation, anti-inflammatory and antimicrobial effects, as well as nociception suppression. Currently, ESWT is applied to treat various medical pathologies. In orthopedics, it is used mainly in the treatment of tendinopathies, treatment of nonunion in fractures of long bones, avascular necrosis of the femoral head, chronic diabetics, nondiabetic ulcers and ischemic heart disease. In dentistry, ESWT has been used in extracorporeal lithotripsy of salivary stones and painful mielogelosis of the masseter. Recently, Falkensammer et al. used ESWT as a supplement in Orthodontics, finding an absence of deleterious effects in the maxillofacial tissues or for pulpal vitality. Li et al. hypothesized that ESWT could be a complementary treatment for the management of peri-implantitis, due to its multiple biological effects at the bone level. Recently Holfeld et al. suggested that the mechanical stimuli generated by ESWT cause an increase in the permeability of the cell membrane, triggering the release of cytoplasmic ribonucleic acid (RNA) through an active process dependent on exosomes. This RNA can stimulate the Toll-like receptor 3 (TLR3) in healthy adjacent cells. TLR3 is part of the innate immune system and modulates inflammation by the stimulation of the production of several cytokines. However, the signal transduction mechanism of TLR3 receptors has not yet been elucidated. 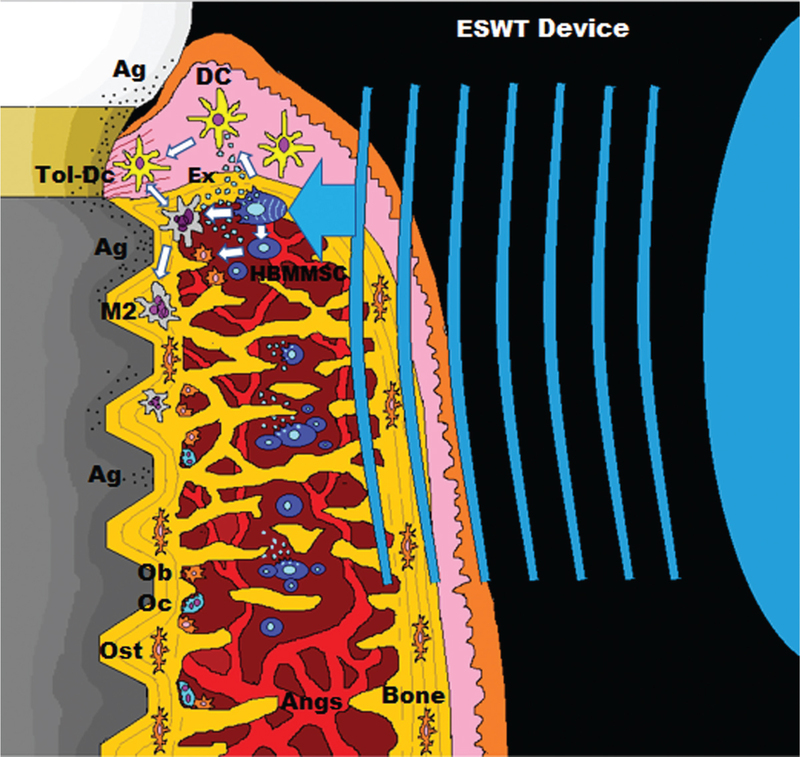 ESWT medical devices could become a new therapeutic strategy to immunomodulate osseointegration. The biostimulator effect on resident HBMMSC can have the potential to guide the tissue response to a more favorable outcome, with the final goal of improving clinical success and reducing the number of complications in dental implant treatment. Branemark PI, Hansson BO, Adell R, Breine U, Lindstrom J, Hállen O et al. Osseointegrated implants in the treatment of the edentulous jaw. Experience from a 10-year period. Scand J Plast Reconstr Surg 1977;11(16 Suppl):1-132. Guercio E, Dinatale E. Consideraciones estructurales y biológicas en la osteointegración. Revisión de la literatura. Acta Odontol Venez 2009;47. ISSN:0001-6365. Trindade R, Albrektsson T, Wennerberg A. Current concepts for the biological basis of dental implants foreign body equilibrium and osseointegration dynamics. Oral Maxillofac Surg Clin North Am 2015;27:175-83. Albrektsson T. What is osseointegration in 2016 and why are we losing bone around dental implants? Congress Scientific Report, Issue 2, February 2017. Arboleya L, Castañeda S. Osteoclastos: mucho más que células remodeladoras del hueso. Rev Osteoporos Metab Miner 2014;6:109-21. Bryce G, Bomfim DI, Bassi GS. Pre- and post-operative management of dental implant placement. Part 2: Management of early-presenting complications. Br Dent J 2014;217:171-6. Olate S, Chaves-Netto HD, Jaimes M, Mazzonetto R, Albergaria-Barbosa RJ. Análisis descriptivo de la reparación ósea asociada a implantes dentales endóseos instalados en perros con técnica sumergida en dos períodos de evaluación. Int J Morphol 2009;27:453-8. Esposito M, Thomsen P, Ericson LE, Lekholm U. Histopathologic observations on early oral implant failures. Int J Oral Maxillofac Implants 1999;14:798-810. Albrektsson T, Dahlin C, Jemt T, Sennerby L, Turri A, Wennerberg A. Is marginal bone loss around oral implants the result of a provoked foreign body reaction? Clin Implant Dent Relat Res 2014;16:155-65. Berglundh T, Claffey N, De Bruyn H, Heitz-Mayfield N, Karoussis I, Könönen E et al. Peri-implant diseases: Consensus report of the sixth European workshop on periodontology. J Clin Periodontol 2008;35(8 Suppl):282-5. Segura A, Pulido G, González V, Navarro F, López F, Panadero A. Periimplantitis y mucositis periimplantaria.Factores de riesgo, diagnóstico y tratamiento. Av Periodon Implantol 2015;27:25-36. Wennerberg A, Albrektsson T. Current challenges in successful rehabilitation with oral implants. J Oral Rehabil 2011;38:286-94. Koka S, Zarb G. On osseointegration: The healing adaptation principle in the context of osseosufficiency, osseoseparation, and dental implant failure. Int J Prosthodont 2012;25:48-52. Trindade R, Albrektsson T, Tengvall T, Wennerberg A. Foreign body reaction to biomaterials: On mechanisms for buildup and breakdown of osseointegration. Clin Implant Dent Relat Res 2016;18:192-203. Hu WJ, Eaton JW, Ugarova TP, Tang L. Molecular basis of biomaterial-mediated foreign body reaction. Blood 2001;98:1231-8. Sennerby L, Ericson LE, Thomsen P, Lekholm U, Astrand P. Structure of the bone-titanium interface in retrieved clinical oral implants. Clin Oral Implants Res 1991;2:103-11. Atsumi M, Park SH, Wang HL. Methods used to assess implant stability: Current status. Int J Oral Maxillofac Implants 2007;22:743-54. Arvidsson S, Askendal A, Tengvall P. Blood plasma contact activation on silicon, titanium, and aluminum. Biomaterials 2007;28:1346-54. Donath K, Laass M, Günzl HJ. The histopathology of different foreign-body reactions in oral soft tissue and bone tissue. Virchows Arch A Pathol Anat Histopathol 1992;420:131-7. Trindade R, Albrektsson T, Galli S, Prgomet Z, Tengvall P, Wennerberg A. Osseointegration and foreign body reaction: Titanium implants activate the immune system and suppress bone resorption during the first 4 weeks after implantation. Clin Implant Dent Relat Res 2018;20:82-91. Viganò M, Sansone V, d’Agostino MC, Romeo P, Perucca Orfei C, de Girolamo L. Mesenchymal stem cells as therapeutic target of biophysical stimulation for the treatment of musculoskeletal disorders. J Orthop Surg Res 2016;11:163. Gao F, Chiu SM, Motan DA, Zhang Z, Chen L, Ji HL. Mesenchymal stem cell and immunomodulation: Current status and future prospects. Cell Death Dis 2016;7:e2062. Meirelles Lda S, Fontes AM, Covas DT, Caplan AI. Mechanisms involved in the therapeutic properties of mesenchymal stem cells. Cytokine Growth Factor Rev 2009;20:419-27. English K, French A, Wood KJ. Mesenchymal stroman cell: Facilitators of successful transplantation? Cell Stem Cell 2010;7:431-42. Hernandez-Urzua M, Alvarado-Navarro A. Interleuquinas e inmunidad innata. Rev Biomed 2001;12:272-80.
van der Jagt OP, Waarsing JH, Kops N, Schaden W, Jahr H, Verhaar JA et al. Unfocused extracorporeal shock waves induce anabolic effects in osteoporotic rats. J Orthop Res 2013;31:768-75. Dunn SL, Olmedo ML. Mechanotransduction: Relevance to physical therapist practice—Understanding our ability to affect genetic expression through mechanical forces. Phys Ther 2016;96:712-21. Zhao L, Wu Z, Zhang Y. Low-magnitude mechanical vibration may be applied clinically to promote dental implant osseointegration. Med Hypotheses 2009;72:451-2. Suhr F, Delhasse Y, Bungartz G, Schmidt A, Pfannkuche K, Bloch W. Cell biological effects of mechanical stimulations generated by focused extracorporeal shock wave applications on cultured human bone marrow stromal cells. Stem Cell Res 2013;11:951-64. Wang FS, Wang CJ, Huang HJ, Chung H, Chen RF, Yang KD. Physical shock wave mediates membrane hyperpolarization and ras activation for osteogenesis in human bone marrow stroman cells. Biochem Biophys Res Commun 2001;287:648-55. Mittermayr R, Antonic V, Hartinger J, Kaufmann H, Redl H, Téot L et al. Extracorporeal shock wave therapy (ESWT) for wound healing: Technology, mechanisms, and clinical efficacy. Wound Repair Regen 2012;20:456-65. Wang CJ. Extracorporeal shockwave therapy in musculoskeletal disorders. J Orthop Surg Res 2012;7:11. Iro H, Schneider HT, Födra C, Waitz G, Nitsche N, Heinritz HH et al. Shockwave lithotripsy of salivary duct stones. Lancet 1992;339:1333-6. Kraus M, Reinhart E, Krause H, Reuther J. Low energy extracorporeal shockwave therapy (ESWT) for treatment of myogelosis of the masseter muscle. Mund Kiefer Gesichtschir 1999;3:20-3. Falkensammer F, Rausch-Fan X, Schaden W, Kivaranovic D, Freudenthaler J. Impact of extracorporeal shockwave therapy on tooth mobility in adult orthodontic patients: A randomized single-center placebo-controlled clinical trial. J Clin Periodontol 2015;42:294-301. Falkensammer F, Schaden W, Krall C, Freudenthaler J, Bantleon HP. Effect of extracorporeal shockwave therapy (ESWT) on pulpal blood flow after orthodontic treatment: A randomized clinical trial. Clin Oral Investig 2016;20:373-9. Li X, Chen M, Li L, Qing H, Zhu Z. Extracorporeal shock wave therapy: A potential adjuvant treatment for peri-implantitis. Med Hypotheses 2010;74:120-2. Grosso A, Burger MG, Lunger A, Schaefer DJ, Banfi A, Di Maggio N. It takes two to tango: Coupling of angiogenesis and osteogenesis for bone regeneration. Front Bioeng Biotechnol 2017;5:68. Holfeld J, Tepeköylü C, Reissig C, Lobenwein D, Scheller B, Kirchmair E et al. Toll-like receptor 3 signalling mediates angiogenic response upon shock wave treatment of ischaemic muscle. Cardiovasc Res 2016;109:331-43. Tepeköylü C, Wang FS, Kozaryn R, Albrecht-Schgoer K, Theurl M, Schaden W et al. Shockwave treatment induces angiogenesis and mobilizes endogenous CD31/CD34-positive endothelial cells in a hindlimb ischemia model: Implications for angiogenesis and vasculogenesis. J Thorac Cardiovasc Surg 2013;146:971-8.